Earth Day on April 22 marks the 49th year that people around the world have marched and participated in projects to clean up the environment. After another year of extreme weather and higher global temperatures, let’s use Earth Day to start our personal transitions to sustainable living with a 10-year-Earth Decade Plan to eliminate one big source of CO2 from our lives. The 2018 Intergovernmental Panel on Climate Change report that established humanity has approximately 12 years to reduce CO2 emissions to 45 percent of the global levels recorded in 2010. Doing so will stabilize global temperature, and combined with additional cutbacks, land restoration, and carbon capture technology, it will put us on a path to return to the atmosphere to the 300 ppm enjoyed by our grandparents. Big changes in every aspect of life are required, but not the wholesale abandonment of modernity. We can eat meat grown responsibly, switch to renewable electric power in transportation, and adopt nontoxic, efficient production processes to achieve a society that could look more like Star Trek than Mad Max. It is time to give up fear and act boldly. Earth Day launched in 1970, the same day President Nixon established the Environmental Protection Agency. The Earth Day Network, which aims to get 1 billion people involved in 2020 for its 50th anniversary, takes place on April 20. This year’s theme is the protection of species. Getting involved can extend to your own decision to clean up a park or remove the toxins from your garage. Earth Day offers programs to support bees, giraffes, coral reefs, whales, elephants, insects, trees, plants, birds, fish, sharks, crustaceans, sea turtles, and the great apes. A great way to get involved is to contribute to the nonprofit Earth Day Network. Change is hard, but we can do it for our families and future generations. The suggestions below represent starting points for a plan to cut the carbon output of your life. These are just a few of the many possible steps you could take. Each of these ideas is likely to require significant effort. And, in some cases, significant expense. By taking these steps, making consistent habits in the case of changing how you eat, or investing in an EV or solar system, you can transform your carbon impact over the next decade. If you choose one big project annually, such as replacing your internal combustion car with an electric vehicle, eliminating excessive carbon-producing foods from your diet, or switching to sustainable sources of clothing, electronics, or groceries, the cumulative reduction over a decade can make a meaningful difference. If we all did it, humans could hit the 45 percent goals laid out by the IPCC. For example, do you commute five days a week? Swapping a gasoline vehicle for its electric equivalent can reduce the CO2 produced during your commute by 7 to 10 tons each year. If half of U.S. commuters, who drive an average of 16 miles each way to work, switched to EVs, the approximate carbon reduction would be almost 800 million metric tons a year. That’s about half of the 1,549 million metric tons produced by U.S. transportation. Let’s say you and three friends go to lunch and each of you has a quarter-pound hamburger, the four of you will consume a meal that cost almost 4,226 gallons of water to produce. Add to that the 26.4 pounds of CO2 emitted by the steer and production process, and a weekly commitment to avoid beef at lunch twice a week will reduce your group’s carbon footprint by 2,750 pounds a year. If you can’t stomach the absence of beef, try one of the emerging alternatives, from mushroom-based to lab-grown burgers. Check out the Blended Burger Project led by the James Beard Foundation. The organization hopes to offer savory options that don’t waste water or produce as much CO2 as beef. Eleven percent of food-related CO2 emissions come from transportation of your meal to the table. Make a change to buying local produce, meat, and dairy to reduce the environmental cost of your dining. Leave your reliance on other people’s energy decisions behind by going solar at home. Solar technology is advancing rapidly, becoming affordable and easy to install and maintain. 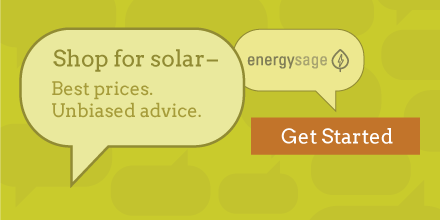 Earth911 has several guides to reducing solar costs and financing your upgrade. Granted, installing solar is expensive but the long-term benefits will last decades. When you move to your own renewable power foundation, you take energy companies’ ability to control your power choices away. Energy flexibility will keep you warm in winter and cool in the summer without tapping into the coal- and natural gas-burning power supply that accounts for 62 percent of U.S. energy. Watch for Earth911’s upcoming guide to Earth Day events and get ready to start your Earth Decade Plan this year. Then you’ll be ready to march with another billion humans on Earth Day 2020 with pride and accomplishments under your sustainability belt.